The Egyptian king under whom, according to some early writers, Joseph came to Egypt, and who, according to Syncellus, flourished in the sixteenth century B.C. ("Chronographia," c. 115, § 7). Josephus names Apôphis as the second, and Julius Africanus enumerates him as the sixth king of the fifteenth, or Hyksos, dynasty. The monuments explain the confusion. They exhibit two Hyksos kings, called Apôpy, with the royal names 'A-ḳnon and 'A-user-rê, apparently corresponding with the second and sixth Hyksos (compare "Mitteilungen der Vorderasiatischen Gesellschaft," iii. 17; for a different sequence see, for example, Petrie, "History of Egypt," i. 241). Syncellus seems to have meant the second Apôphis, under whom the Hyksos were expelled from Egypt. This one reigned at least thirty-three years according to the monuments, forty-nine according to Manetho, to about 1570 B.C. 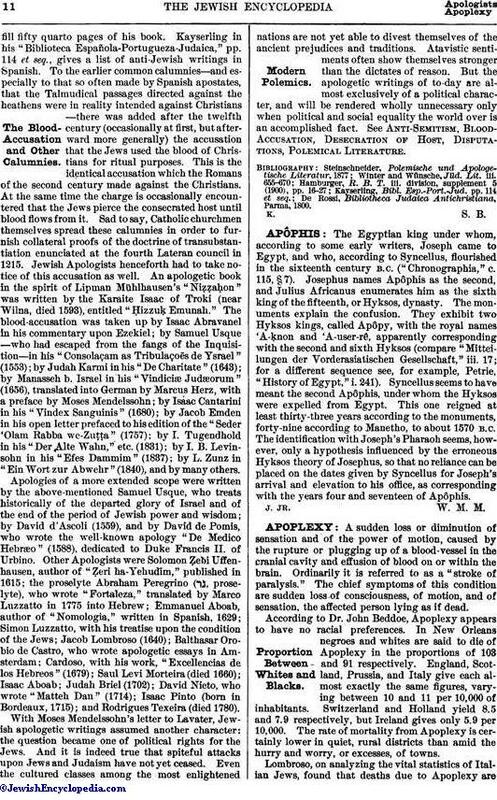 The identification with Joseph's Pharaoh seems, however, only a hypothesis influenced by the erroneous Hyksos theory of Josephus, so that no reliance can be placed on the dates given by Syncellus for Joseph's arrival and elevation to his office, as corresponding with the years four and seventeen of Apôphis.